From left|! 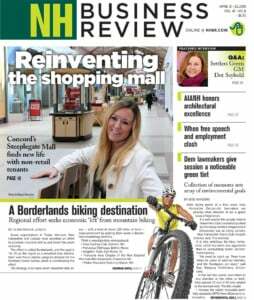 !| 2015 Seacoast NH Start-Up winners and judges: Candee Noorda of PickUp Patrol; Sean Peschel|! !| RW Creteau Tech; Lori Smart|! !| CEO|! !| Smart ATI Construction; Michael O’Laughlin|! !| Lydall Performance; Brian Apple|! !| Eric Edvalson|! !| Maria Edvalson|! !| Tony Edvalson and Rylee Noorda of PickUp Patrol; Joel Robinson|! !| Vid Fall; and Jonathan Shapleigh|! !| Bank of New Hampshire. A team of teenage entrepreneurs whose app streamlines how schools can keep track of students’ after-school plans, took home the two top prizes in the 2015 Seacoast NH Start-Up contest. 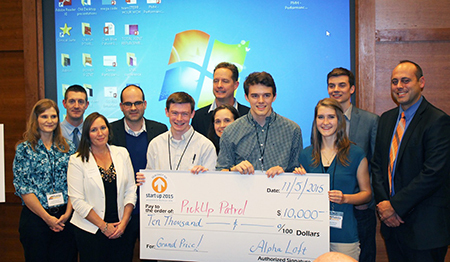 Nashua-based PickUp Patrol won both the grand prize and People’s Choice award at the third annual new business competition, held Nov. 5 at Frisbie Memorial Hospital in Rochester. The prize package included $10,000 in cash and $30,000 in in-kind services, including one year of rent-free office space in Rochester, an interest-free loan, a one-year membership in the Rochester Chamber of Commerce, and legal and other business services. Teenagers Brian Apple and Tony Edvalson, two of the three founders of the company, began and ended their presentation with the rallying cry, “No more notes!” and proceeded to explain the market niche their app seeks to fill – making it easier for schools to keep track of students’ end-of-day plans than the old system of handwritten notes from parents, including pickups, early dismissals and other requisite communications. The PickUp Patrol’s business plan detailed a national market with 104,000 kindergarten through 8th-grade schools and potential annual revenue of $104 million. Apple and Edvalson, students at the Academy for Science and Design public charter school in Nashua, were joined in accepting the two awards by their fellow team student and adult members: co-founder and fellow student Rylee Noorda; Maria Edvalson; Daniel Brackett; Eric Edvalson; Candee Noorda; Renee Dickson; and Cath Edvalson. The other four finalists were: Adasko Enterprises LLC, which is developing a prototype for a new barbecue tool; EasyImpact, an app to reduce municipal management costs and promote local economic development; Ready to Relo, an app to connect businesses to identify and hire talent across regional borders; and Vera Roasting Company, a company marketing coffee with a heart-healthy additive. All five finalists are business start-ups based in the state of New Hampshire as the rules require.